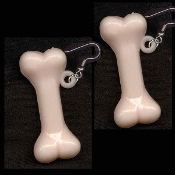 Huge Vintage DOG BONE EARRINGS - Funky Retro Punk Novelty Halloween Charm Jewelry - BIG realistic 3-D plastic gothic skeleton toy gumball vending charms, approx. 2" long x 7/8" wide. No BONES about it. These are so Cool!